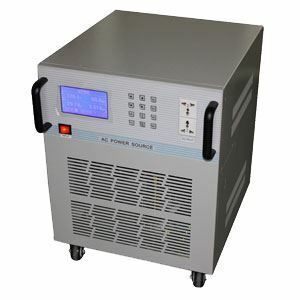 5 kVA static frequency converter, single phase 120V 60Hz (e.g. USA) to 220V 50Hz (e.g. UAE), built-in step up transformer, adjustable frequency and voltage, changing 120V 60Hz to 220V 50Hz in one step. 5 kVA AC power static frequency converter, converting 120V 60Hz to 220V 50Hz in one step by built-in step up transformer, also can change 220V to 120V, output frequency up to 400Hz, voltage up to 300V. This converter can be connected to computer. Nikola Tesla built the first 3 phase, alternating current (AC), generator system to power the lighting for the 1893 Columbian Exposition in the US to commemorate the discovery of the New World by Columbus in 1492. It was a 60 cycle system. It was so successful that 60 Hertz became the standard in the US and now North America. European competition investigated alternatives and found that below 50 cycles, one could perceive the fluctuations in an incandescent light bulb. That prompted Europe to standardize on 50 Hertz. India has 50 Hz because the UK adopted 50 Hz as their standard. 60Hz systems usually use 120V or thereabouts for the domestic power supply, while 50Hz systems tend to use 220V etc. This has the impact that house wiring needs to be twice the cross section for the 120V system for the same power. However the optimum system is accepted as around 220V (wire size and power required versus safety). In most of the US the 120V system is in tandem with the 240V US system that provides for the higher powered appliances like stoves and clothes dryers, while 120V does wall outlets and lights. We moved to Saudi Arabia a year ago for employment. While there we bought the following appliances brand new from Samsung: Dishwasher, Washing Machine and fridge. We then moved back to UK few months ago and brought all these appliances back with us thinking that since the voltage is the same they should work. We then realized that the power frequency in Saudi Arabia is 60Hz and all these appliances are rated for 60 Hz only while the power frequency in the UK is 50 Hz. We realized it's unsafe to run these appliances on 50Hz. So now we don't know what to do with these appliances (chuck them? destroy them? sell them for parts? ...etc.) Then I came across your site while researching online and realized that we may be able to use a frequency converter to power them up. So I wonder would you have anything suitable for us? I believe what we need is a 50 Hz to 60 Hz frequency converter where input and output voltages are the same at around 220volts. You can take GoHz frequency converter to do the 60Hz to 50Hz power conversion, but we think it's too expensive to your appliances, maybe better to buy new appliances instead of changing the frequency. Yes, you can just get a GoHz converter to do the conversion, from 120v 60Hz (US) to 220v 50Hz (Italy) to make all of your appliances work at the best condition. Please contact GoHz sales engineer for more details. Hello, generally cell phone and laptop computer are compatible with both 50Hz and 60Hz, you just need a transformer to convert the voltage.